In the historic centre of the Russian city of Krasnodar, we find the new offices of Black Sea Financial Company (BSFC), a financial company that deals with different property activities: market studies, design, construction, management, etc. From the outside, the elegant building with tall windows and six floors conveys a bright, futuristic atmosphere, presenting clients and pedestrians with the corporate values of the company. Architect Alesandr Andréevich relied upon different firms of PORCELANOSA Group for the interior design of the modern facilities of BSFC. The sea, water, time, vitality and dynamism were the themes upon which he wished to base the design. On this basis, KRION® became the ideal material due to its thermocurving property. 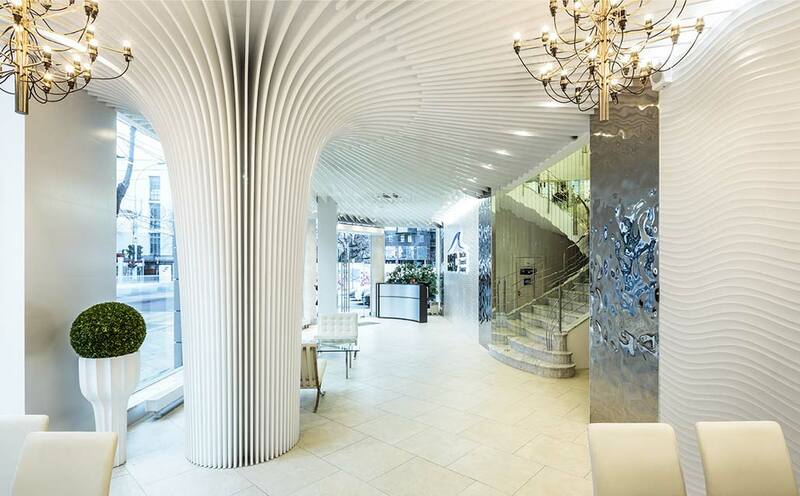 Inspired by the movement of water, KRION® was used in the covering of the pillar and the roof. The central column is the epicentre from which smooth lines originate, dispersing across the roof, which along with the Sea Silver (Venis) and Seul Nacar (Porcelanosa) ceramic coverings, gives the hall a dynamic and futuristic touch.